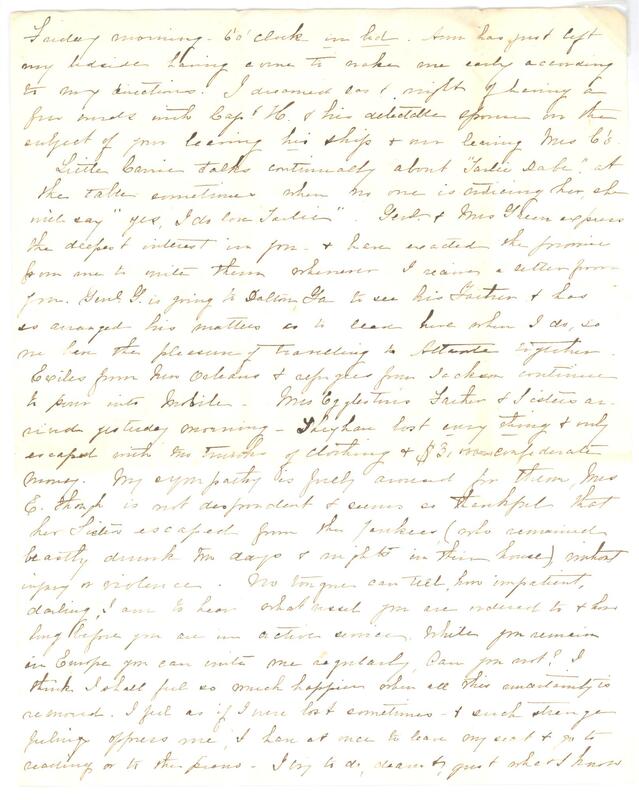 Item Description: Letter, dated 28 May 1863, from Margaret (Maggie) Lea Graves to her husband, Charles Iverson Graves. 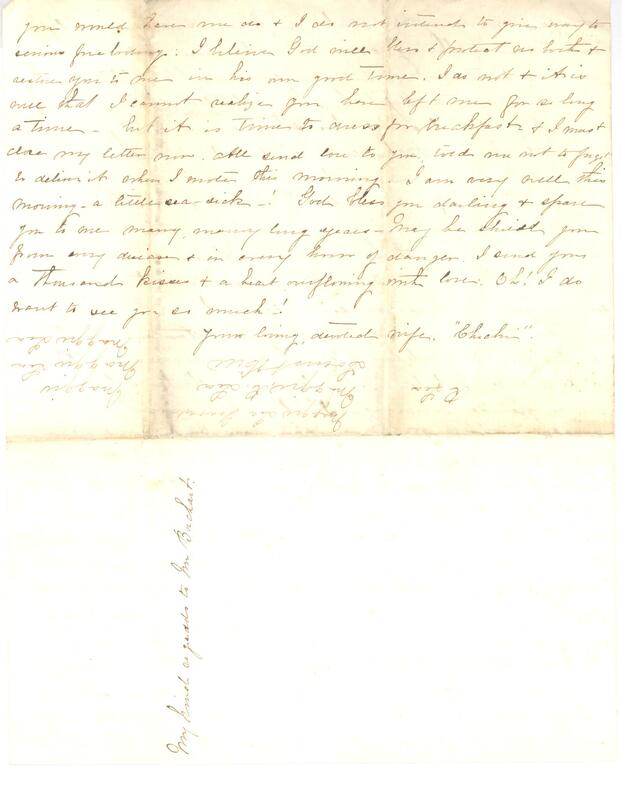 In this letter, Maggie describes aspects of her life in Mobile, AL to her husband, Charles, while he is away on active duty during the Civil War. Item Citation: From Folder 14 of the Charles Iverson Graves Papers #2606, Southern Historical Collection, Wilson Library, University of North Carolina at Chapel Hill. Friday morning – 6 ‘o’ clock in bed. Ann has just left my bedside having come to wake me early according to my directions. I dreamed last night of having a few words with Capt. H _ his delectable spouse on the subject of your leaving his ship + our leaving Mrs. C’s. Little Carrie talks continuously about “Tarlie Dabe” at the table sometimes when no one is noticing her, she will say “yes, I do love Tarlie”. Genl + Mrs. Green express the deepest interest in you – + have exacted the promise from me to write them whenever I receive a letter from you. Genl G. is going to Dalton, Ga to see his Father + has so arranged his matters as to leave here when I do, so we have the pleasure of travelling to Atlanta together. 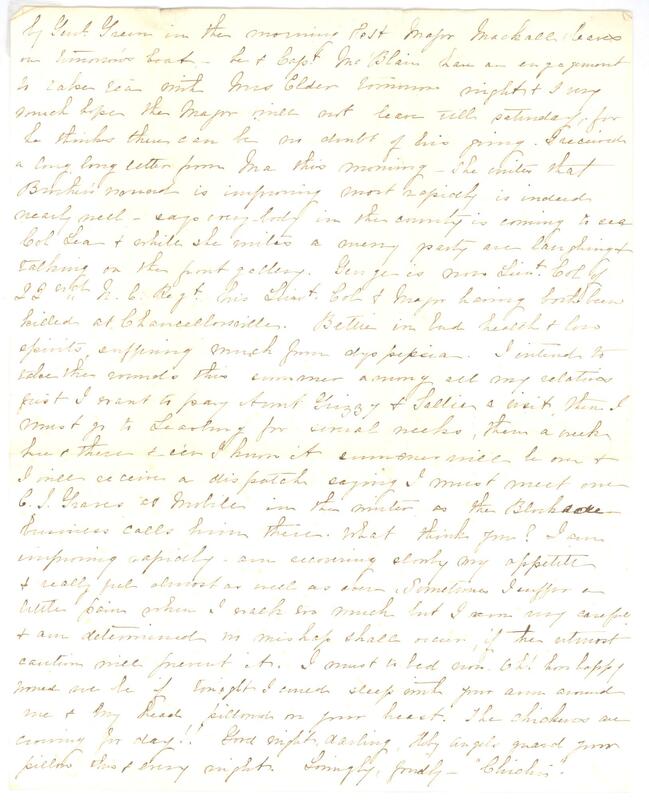 Exiles from New Orleans + refugees from Jackson continue to pour into Mobile – Mrs. Eggleton’s Father + Sisters arrived yesterday morning – They have lost everything – only escaped with two trunks of clothing + $3,000 Confederate money. 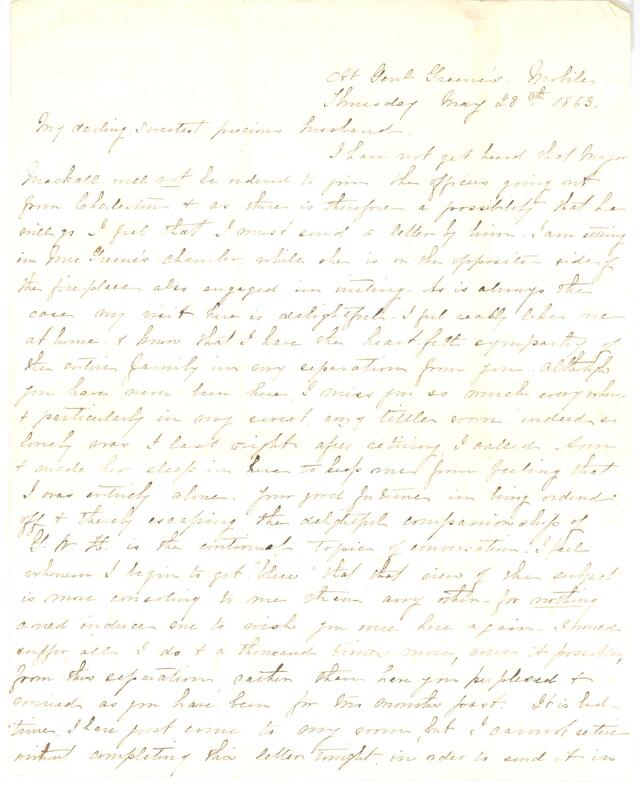 My sympathy is freely aroused for them, Mrs. E. though is not despondent + seems as thankful that her sisters escaped from the Yankees, (who remained beastly drunk two days and right in their house), without injury or violence. No tongue can tell how impatient, darling, I am to hear what vessel you are ordered to + how long before you are in active service. While you remain in Europe you can write me regularly, can you not? I think I shall feel so much happiness when all this uncertainty is removed. I feel as if I were lost sometimes – + such strange feelings oppress me, I have at once to leave my seat + go to reading or to the piano – I try to do, dearest, just what I know you would have me do + I do not intend to give way to serious foreboding: I believe God will bless + protect us both + restore you to me in his own good time. I do not + it is well that I cannot realize you have left me for so long a time – but it is time to dress for breakfast + I must close my letter now. All send love to you, [?] not to forget to deliver it when I wrote this morning. I am very well this morning – a little sea-sick – ! God Bless you darling + spare you to me many, many long years – May he shield you from every disease + in every harm of danger. I send you a thousand kisses + a heart overflowing with love. Oh! I do want to see you so much -!